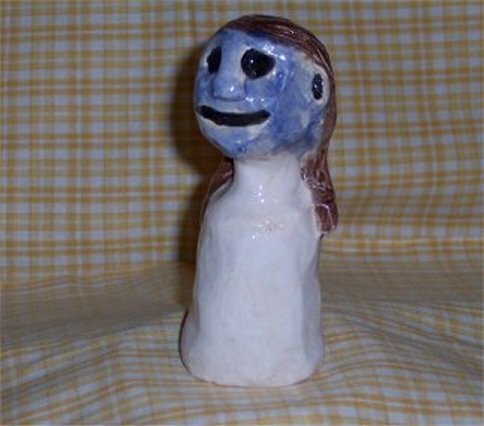 Your Clay Project » What Is It? A rich, burnt-golden glaze gives this medallion the aura of an ancient artifact. A hole at the top calls out for a leather lacing to make a necklace. 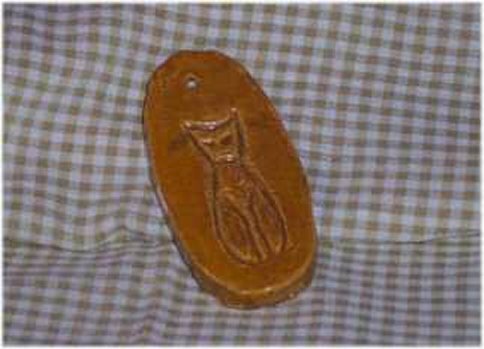 It’s about an inch wide and 3 inches long, with a slender cat etched in the middle. Downright hieroglyphic, don’t you think? Okay frankly, this piece gives me the heebie-jeebies. But the cool thing about collecting something odd and folksy is that once you tell other people you’re collecting it, they will occasionally bring you a really unique piece they’ve found for you. My mother-in-law bought this for me at a flea market near Unionville, Missouri. I initially thought this might have been something like a pie-bird, but realized quickly that it had no vent holes in it. After some further studying, I’ve determined it was probably intended to be a puppet head – but, the indentation in the bottom for the puppeteer’s finger isn’t deep enough to compensate for the weight of the actual head, so it ended up being a cast-off. My daughter points out that it could be used as a candle snuffer, and I agree – if only because it will scare the fire out. This piece measures a little under 5 inches tall but has no identifying marks.